Here we are on Shamian Island, Guangzhou, near the U.S. embassy where we were to get the U.S. visa for Ruby and attend the "swearing in" ceremony. This is one of three photos we received when we got the referral file from China. She was 9 months old at the time of this photo. The "Mugshot" from the file photos. The last photo from the file. This show Ruby in a walker, with the senior center that is adjacent to the orphanage in the background. The orphanage is in the town of Yongxiu, Jianxi province. This is the first photo I took of Ruby, moments before she was "presented" to us in a meeting room in the hotel in Nanchang. An emotional moment. Suz crying alot as she holds Ruby. ChaShen helps entertain Ruby with a Pooh. Going to the orphanage for a visit. In Ruby's room at the orphanage. The sheets show the schedules and activities of the children in that "family". Kids are grouped with a primary caregiver. Note the butterflies. "Dieh" means butterfly in chinese. Suz, Ruby and two of her caregivers. Ruby and her favorite biscuits, one in each hand. Suz, Ruby and the orphanage director. This photo is from the Unified Adoption Document, i.e., the adoption decree, issued in Nanchang, which made the adoption final from the Chinese government's perspective. She was officially adopted on October 28, 2002. Note the offical embossed seal on the photo. Dad and Ruby on the steps of the Tengwang Ge or Jumping King Pavilion in Nanchang. Ruby attending her first birthday party, which was for one of her orphanage buddies. She loved the birthday cake. In China the cake icing is made using the densest fresh cream, which of course adhered to her face, hands, clothing, table, our clothing. Halloween in China. Many of the other adoptive families from the United States brought costumes and dressed their kids up for the holiday. Of course, this made no sense to the Chinese. Not sure about this costume thing. The older girl in the photo is ChaShen. She is older sister to a newly adopted girl, and herself adopted from Hunan province. Here are shots of Ruby in the playground behind the hotel in Nanchang. It will be some time before she is really able to play in such an environment, but it was fun to put her in the magic mushroom and other kiddie amusements. This was where we discovered her fear of plants. We wanted to show her the yellow mums up close but she squirmed and writhed in horror the closer she got. It will take some time before she explores plant material on her own. Ironic given her parents are such avid gardeners! This is at a teahouse in Guangzhou. Some of Ruby's first table food, and learning to eat with a spoon. 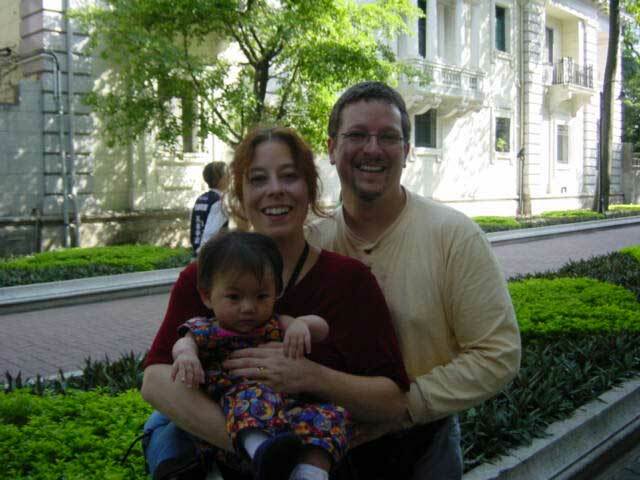 The family at the Sun Yatsen memorial hall in Guangzhou. Ruby with her favorite bottle of teething tablets. Suz and Ruby next to an enormous cloisonné vase at a folk-art museum. All the kids adopted at the same time, from the same orphanage in Yongxiu, Jiangxi province, and ChaShen. Ruby enjoying all the picture taking. Last photo before leaving for home. This photo was provided by the orphanage and includes the three other babies adopted by our travel group. The family arrives in Seattle 3 AM.